Danny Harris FIMI Fleet Services Manager Circle Leasing Limited. 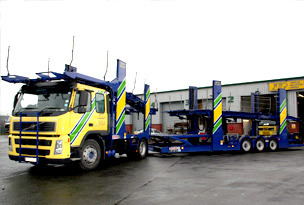 The strength in our fleet of modern transporters has resulted in the success and substantial growth the company has achieved since being established in 1990. Each of our transporters displays our distinct corporate colours of yellow, blue and green. Attached to these distinct corporate colours is the excellent reputation for high levels of service quality that J&P Vehicle Deliveries provide. Our professional corporate image does not stop there; this is a theme that is instilled throughout J&P Vehicle Deliveries. Each of our drivers is supplied with corporate uniforms, ensuring each of our drivers reflects the professional image that both J&P Vehicle Deliveries demand and that our customers expect. 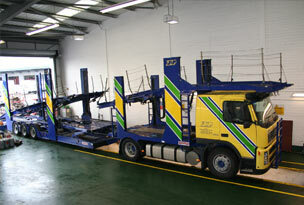 The logistical aspect of J&P Vehicle Deliveries is managed from our Head Office in Bolton. Where we have a team of people ensuring our trucks are at the collection point that has been agreed with each of our clients on the agreed date and time. Our strong motorway network which is located near our head office allows us to distribute our transporters efficiently and enables us to have a transporter with our customers within a short period of time. The Health & Safety of our drivers is something we take very seriously, and therefore we ensure each of our drivers are supplied with high visibility jackets and hard hats. This helps to maintain the expected Health & Safety standards of J&P Vehicle Deliveries. The repair and maintenance of our fleet is second to none, our in house technical engineers are consistently monitoring the efficiency of our fleet. Our self maintained workshops enable us to keep the downtime of our fleet to an absolute minimum. 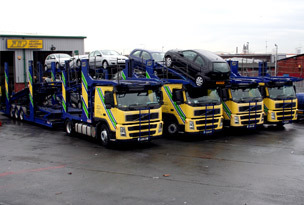 Furthermore, we at J&P Vehicle Deliveries boast another attribute which a number of our competitors do not. We have the capabilities to store vehicles on our premises overnight if required, ensuring your vehicle is safe and secure throughout its transit period with J&P Vehicle Deliveries.